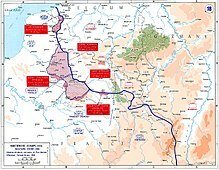 The 1918 Spring Offensive or Kaiserschlacht (Kaiser's Battle), also known as the Ludendorff Offensive, was a series of German attacks along the Western Front during World War I, which marked the deepest advances by either side since 1914. The German authorities had realised that their only remaining chance of victory was to defeat the Allies before the overwhelming human and matériel resources of the United States could be deployed. They also had the advantage of nearly 50 divisions freed by the Russian surrender (Treaty of Brest-Litovsk). After the offensive, not enough German soldiers were still alive to win the war anymore. ↑ Churchill, "The World Crisis, Vol. 2". German casualties from "Reichsarchiv 1918"
↑ Churchill, "The World Crisis, Vol. 2". British casualties from "Military Effort of the British Empire"
↑ Churchill, "The World Crisis, Vol. 2". French casualties from "Official Returns to the Chamber, March 29, 1922"
Wikimedia Commons has media related to Kaiserschlacht. This page was last changed on 13 August 2018, at 18:04.